This mower features an innovative ‘ergoflex’ handle design that makes it comfortable for use by just about every size and shape of person. 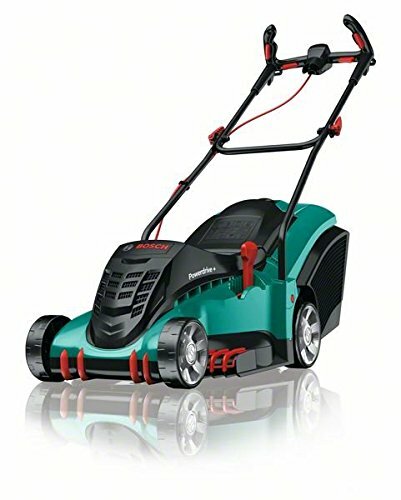 If you prefer to grip a handle with both hands facing up, or you are more inclined towards an upright ‘joystick’ type grip, then this mower is able to accommodate both, thanks not only to both types of handle being present but with ‘dead mans’ levers in all positions. Given that this is the main point of interface between you and the mower it makes good sense that a great deal of time and effort has gone into designing it, and the good news is that it works really well, which should (fingers crossed) take some of the pain out of the task of mowing the lawn, which can only be a good thing I’m sure you’ll agree. The other key design feature of the Rotak 40 are the red ‘grass combs’ that you’ll notice are positioned at the front of the mower just behind the front wheels. By setting the front wheels inside the diameter of the cutting blade this design allows the grass combs to guide and funnel the grass into the path of the blade. This is particularly handy when cutting along a border where the grass could otherwise be folded over the edge of the lawn by the front wheels and not get cut. It’s a little feature, but it saves time and effort going back over areas, or even resorting to getting the strimmer out. Another really nice feature of this mower is the ‘Powerdrive’ motor system. Thanks to some clever electronics, the motor will compensate for the increased power required in tougher and thicker areas of grass by increasing the torque. Don’t ask us how it’s done, just know that it’s a really useful feature to ensure that both the mowing experience and end result are as smooth as possible! 15m long cable suitable for lawns of a size suitable for electric mowers. 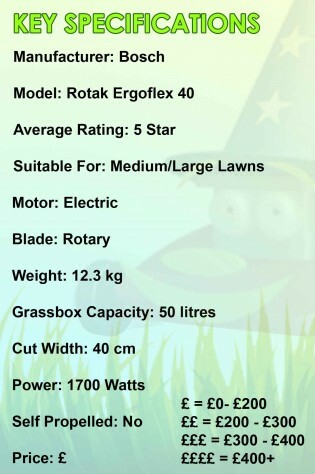 We think that this is a superb machine with some really nice features, and one of the best electric lawn mowers available at the budget to mid range end of the electric lawn mower market. Most importantly, like all Bosch lawn mowers it’s been designed with the user in mind, so you know that you’re in for about as user-friendly an experience as you could hope for when you use this mower. 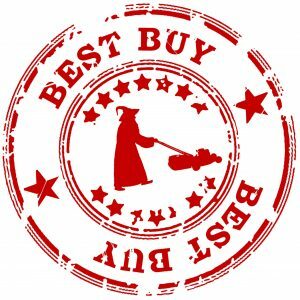 Other than that, with a little maintenance and cleaning as and when required, you should get years of good reliable grass cutting performance from it. Yes, there are a few minor drawbacks in terms of manufacturing quality, but these are rare, and quickly dealt with by the manufacturer should they arise.